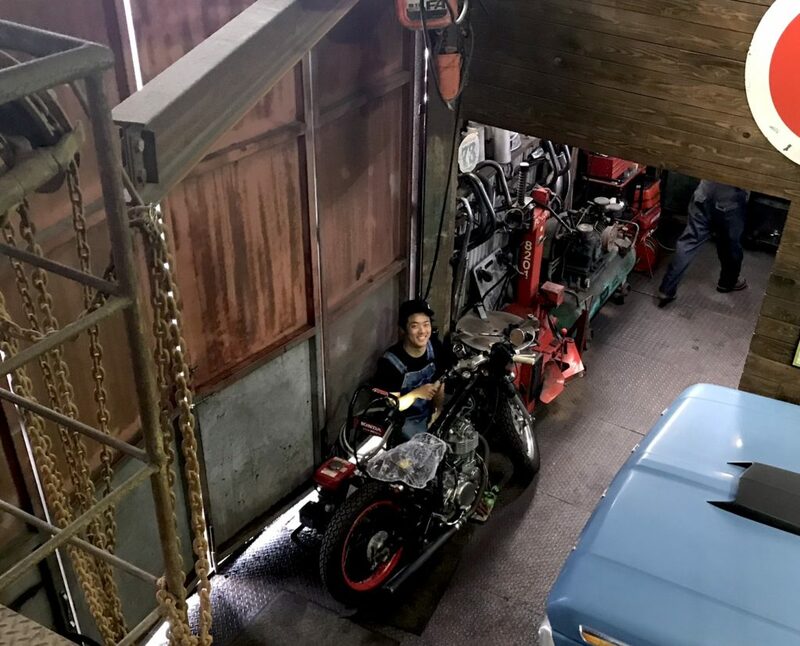 The rain began to fall just as I stepped into the door of Heiwa Motorcycle, a dimly lit, overstocked, two-story industrial space on a narrow spit of land near the port of Hiroshima. The sky outside had a heavy, ominous look. The oncoming rain was the beginning of a monsoon storm that would eventually force millions of western Japanese residents to evacuate their homes, and cause flooding that would take more than 225 lives. Inside, Heiwa workers were choosing strategic locations for metal pans to catch the water finding its way through the corrugated metal roof, and moving racks of vintage clothes and shelves of collectible Thermos bottles, lunchboxes, plates and cups that Heiwa stocks in its cluttered second-floor second-hand store. Kengo Kimura, though, was calm and cheerful when he arrived. 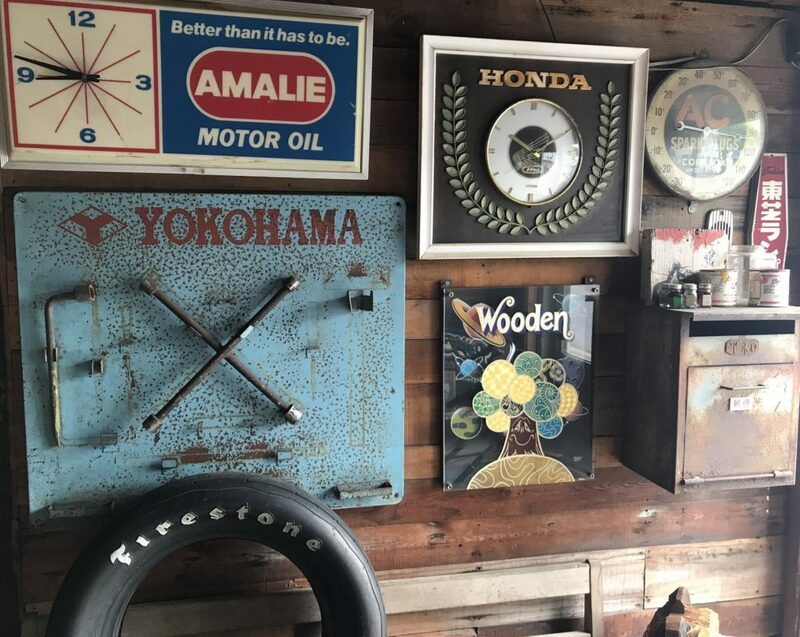 Heiwa’s founder and designer sat comfortably on a ratty sofa, flanked by walls of vintage signs and posters, wearing a black Heiwa T-shirt and green camo pants. 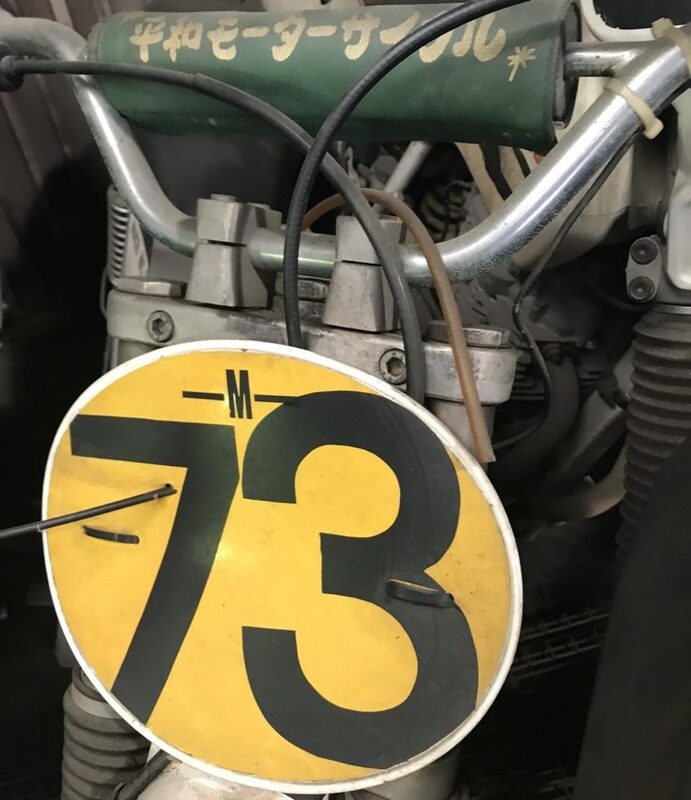 Under gentle reggae music, sipping iced coffee and stroking his goatee, the Heiwa founder talked freely about building custom bikes – one of which, “Dirty Pigeon,” is part of the Custom Revolution exhibit underway until March 2019 at Los Angeles’ Petersen Automotive Museum. Born in Hiroshima, of parents and grandparents also born in the port city, Kimura studied economics at the University of Hiroshima until a part time job at local motorcycle shop A. Beard derailed his academic interests. 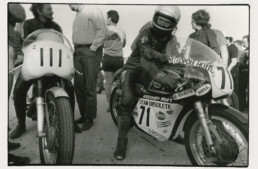 Kimura had long owned and done custom work on older British bikes, with a strong preference for Triumphs. But his bosses at A. Beard didn’t share his interest in design. 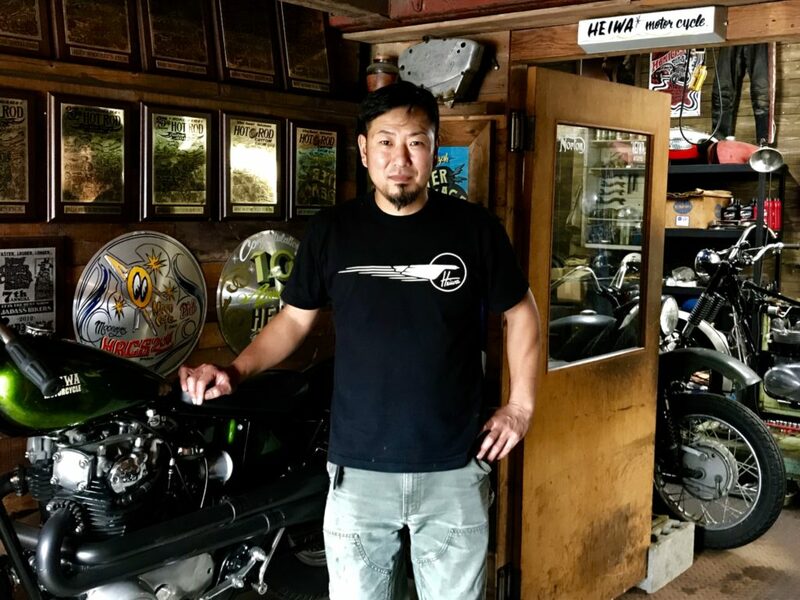 Frustrated after nine years of prepping new bikes and repairing old ones, he opened Heiwa. The company name means “peace,” a paean to his city’s post-nuclear cry for world harmony — the immense green space at ground zero for the American atomic bomb attack in August, 1945 is called Heiwa Park. The boulevard approaching it is Heiwa Boulevard – and the pigeon is its symbol. Kimura’s first Heiwa design was a re-imagined Honda FTR, which got a custom tank, seat, fenders and exhaust pipe. A female customer from Kimura’s previous employer bought it for what he recalled was about Y500,000 – or $4,500. “Very cheap!” Kimura laughs. That was the first of more than 100 projects, by Kimura’s reckoning. About half were “light customs” that got only a fender bob or a paint job. 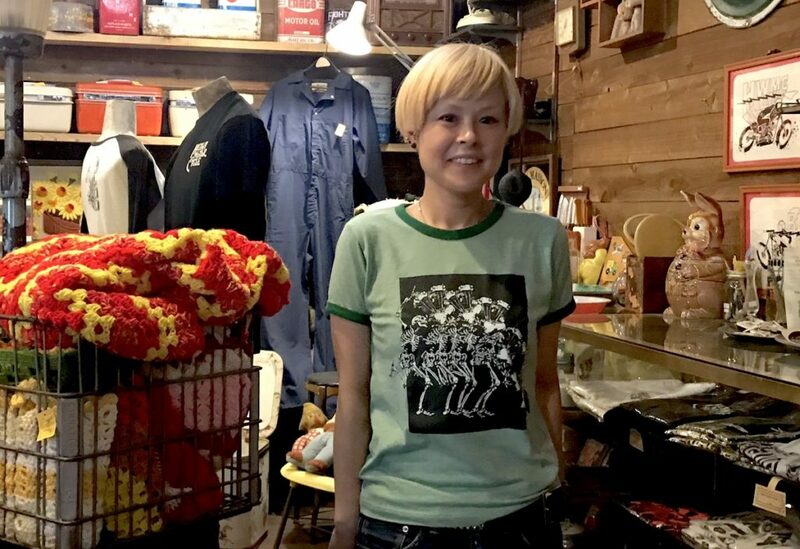 (Pin striping and paint duties are handled by Kimura’s partner Lou, the cheerful, elfin woman who helps manage the business and also runs the vintage shop.) The other half got a fuller treatment, each requiring four to six months of design, engineering and build. Kimura and Heiwa enjoyed local acclaim early on. National and international attention followed. Kimura began entering bikes into the annual Moon Eyes Hot Rod custom show in Yokohama, Japan. Bike EXIF noticed, and began tracking the designer’s efforts. In 2016, his “Masterpeace,” built from a 1968 Triumph TR6, was named Best in Show. The following year Kimura entered his “Dirty Pigeon”, featuring a 1971 TR6 engine slung inside a highly modified frame and adored with custom tank, seat, swingarm and exhaust system. Gleaming chrome accents a deep gray color scheme. 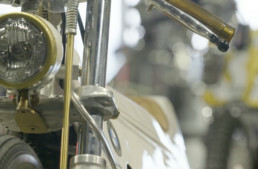 Modified Paioli forks support a subtle headlamp bracket and custom triple clamp, a masterwork of creative compression. “Dirty Pigeon” won the top Yokohama honors for 2017, and sealed Kimura’s reputation. Tucked under a tarp at the rear of Kimua’s dimly-lit shop was the 2018 entry, a derelict BMW R75/6. “It’s top secret,” Kimura said with a twinkle in his eye, then removed the tarp to reveal a highly engineered re-imagining of the 1978 airhead. Kimura’s creations – whether they began life as a Kawasaki W650, Suzuki GZ125, Yamaha SR500 or vintage Triumph, Norton or Matchless – share essential design elements. The tanks are angular tear drops. The exhaust systems are long and lean. The bobbed frames and fenders are reductive and elegantly simple. “When I customize a motorcycle, the most important thing is the line,” Kimura said. “I design the bike so that it does not go down or go up. That is my style.” Now 44, married and the father of three, Kimura splits his time between the Hiroshima garage and his home in Hatzukaichi, near the famed temple city of Miyajima. When he’s not in the shop or tending to his family, the designer sneaks off to race vintage MX at a nearby track. 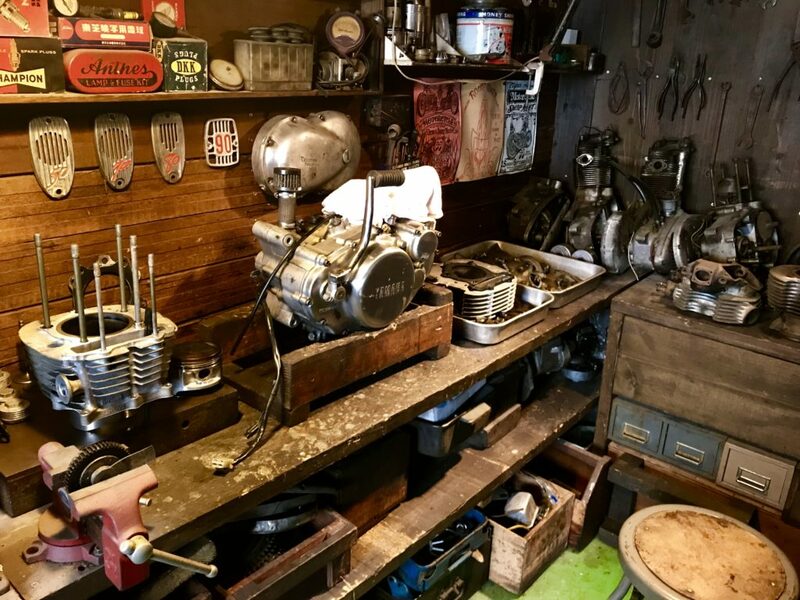 A Honda Elsinore and Maico 250, stored in a corner, still featured flecks of dried mud from their last outing. The top secret BMW already had a new owner. The Yokohama entry would go on to a Chinese buyer who owns a private BMW museum. Other machines were still available. 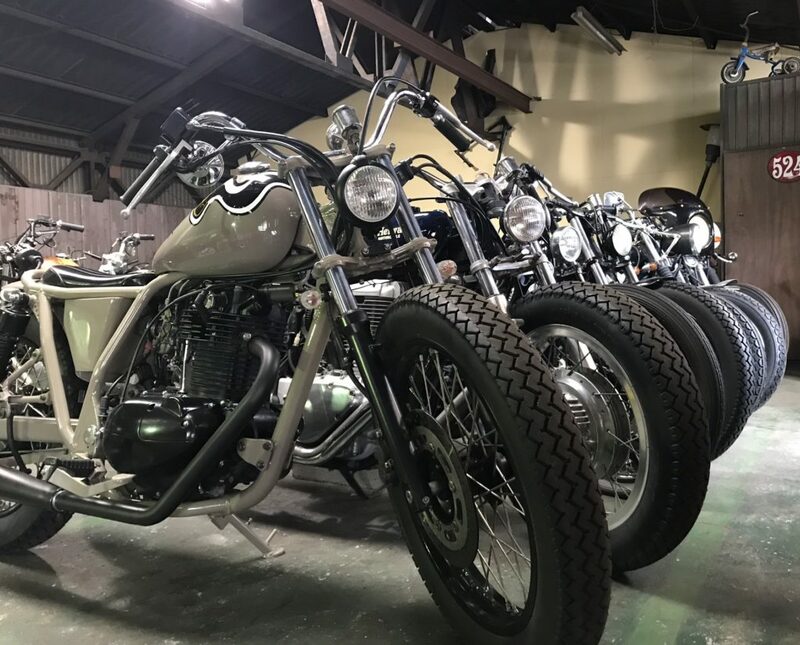 Leading his visitor through the work bays, past an elderly basset hound hiding from the dripping rain, up to a second-floor showroom, Kimura showed off custom reworkings of 70s Triumphs, 80s Suzukis, 90s Yamahas and even a Harley-Davidson 250 from the Aermacchi era. None bore a price tag, but Kimura said the 250cc customs were going for Y700,000 while the 750cc creations cost upwards of Y1,300,000 – a range of roughly $6,200 to $12,000 – or higher. 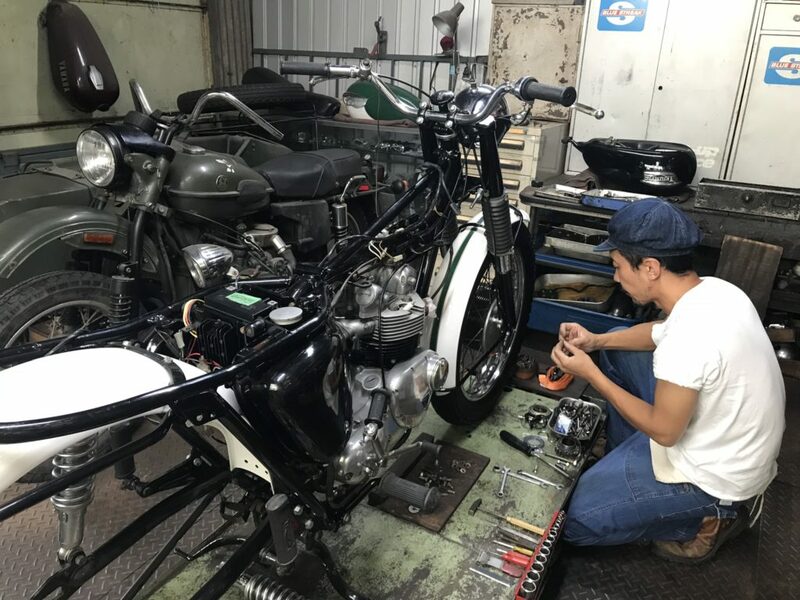 Kimura has no trouble sourcing parts locally for the Japanese brands, and can do custom Harleys using nearby suppliers. But vintage brands, especially the British ones, require more effort. 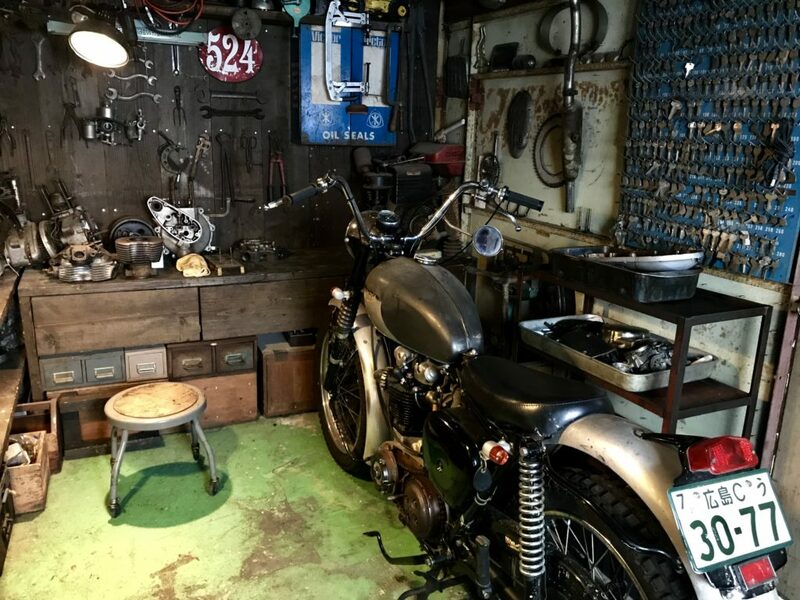 He relies on helpers in England and the U.S. – and keeps a container ready in a downtown Los Angeles industrial space – to locate base bikes for those projects. When he begins a design, he said, he does not draw. Indeed, there seemed to be no drafting table or drawing area anywhere in the cozy workspace. “I only imagine,” he said. Often the look begins with the tank. He generally borrows one from a junked Japanese model, even if it’s going to end up atop a vintage European base bike. Kimura, a team player, said repeatedly that his operation would not function without helpers. When it was time to say goodbye, the Heiwa honcho gathered his team outside for a photograph. 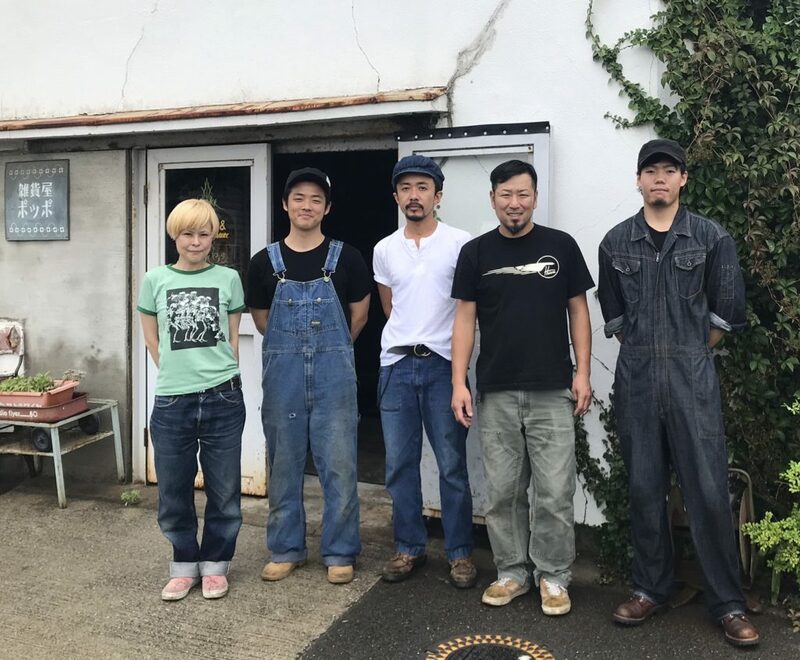 Mechanics Daisuke Noda and Makoto Konishi, pin striper Lou and trainee Eikan posed in front of the Heiwa headquarters, during a short break in the storm, while Kimura asked a passerby to take the picture. Then the team went back to work and it started raining again.